A report released two weeks ago independently confirmed what some investigative journalists reported last year: that Cook County’s property tax assessment system is stacked against lower-income households. On Thursday, it was standing room only at a hearing on that report held by the Cook County Board Finance Committee. 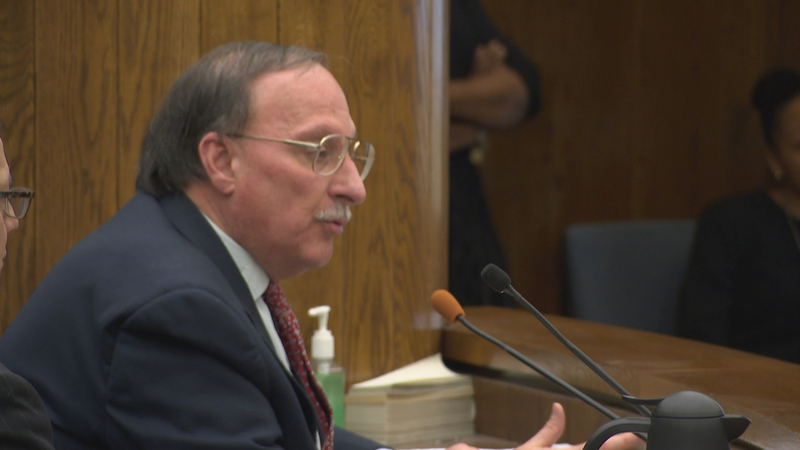 Commissioners grilled the top deputy in the assessor’s office on how it’s addressing the enormous disparity in the county’s assessments, and how soon taxpayers will be seeing a more equitable system. Neither Cook County Board President Toni Preckwinkle, who commissioned the report, nor Cook County Assessor Joseph Berrios were at the hearing. Instead, representatives from their offices were there and it was Thomas Jaconetty, an attorney with the assessor’s office, who came under the most questioning. First and foremost on commissioner’s minds, and that of most everyone in attendance Thursday, was how – and how quickly – the assessment system can be fixed to become more equitable. Thomas Jaconetty speaks Thursday at the hearing. Whether or not Cook County taxpayers will be seeing more equitable tax bills soon depends on how you define “soon.” After 40 years of what everyone now agrees is a broken system, the assessor’s office says reforms can be implemented during the valuations that take place over the next three years. And as it stands, it appears the communities on the city’s South and West Sides, as well as the south suburbs, will be getting updated valuations later in the three-year Cook County cycle. Fritz Kaegi, a strong challenger to the embattled Assessor Berrios, took the opportunity to have his say before the hearing, blasting one aspect of the CCA report. “Commercial buildings exist to generate income. So, unlike the valuation of houses, Illinois uses an income-approach-to-value for income-generating or commercial buildings. The primary election is less than three weeks away and the assessor’s race will be one to keep an eye on. Feb. 16: A bombshell report on Cook County’s property tax system exposes flaws in how the assessor determines how much residents owe in property taxes. Feb. 6: Another race in the March 20 primary that is heating up: Cook County assessor. The field narrowed Tuesday to one contender taking on incumbent Joe Berrios, but the dirt is still flying.